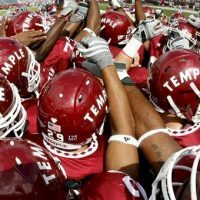 After a overtime victory over an undefeated Cincinnati Bearcats’ team, the Owls are on a bye week. Reporter John Press takes us back to the homecoming tailgate for OwlSports’ first edition of Tailgate Trivia. Defensive tackle Michael Dogbe joins anchors Vince Coll and Dan Bartels at the desk for an exclusive interview. Finally, Vince and Dan go “No Huddle” and take a look at the current standings in the AAC.